What are the Students’ Positions in a Morning Announcement Team? Producing videos for morning announcements in a school is almost like producing a film. Of course, it’s nowhere near as complex as producing an actual film. However, the principle remains the same. There are certain tasks involved and these tasks are overseen by a particular bunch of people. 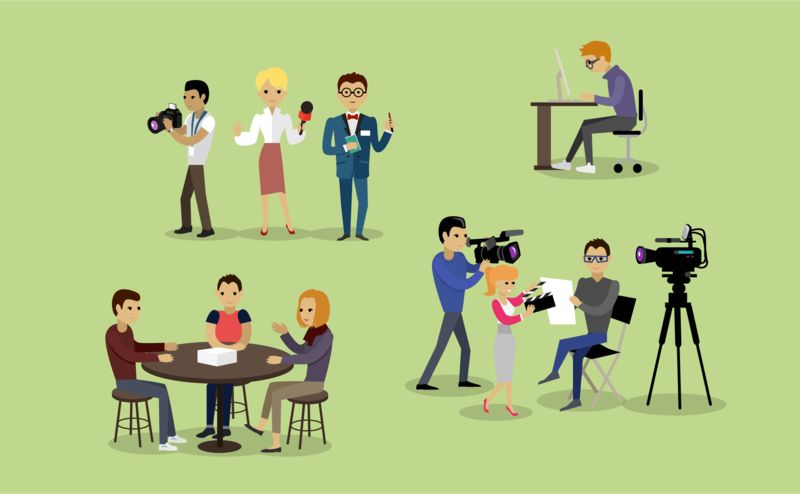 In this blog, we are going to take a good look at who the various team members are and what their roles are with regard to video production. As someone in charge of producing morning announcement videos, you will find this information to be quite useful. Contrary to popular belief, the director is never the boss. It’s actually the producer. The producer is, as they say, the big boss. He/she is responsible for the entire production, right from the beginning to the end. Producers develop the basic concept, finalize the scripts, manage the whole team, and even look after the financial aspects of the production. So, when assigning this role to a student, make sure you find someone who can take up the responsibility, preferably, a student who has shown leadership skills in the past. You may also choose the least likely candidate and put them in this role to help them overcome their hesitation and fears as well. The director is the one who actually manages the shoot. They could be called the second-in-command. Directors are the ones with the vision, they are the equivalent of a book’s author. Of course, they still need to depend on a team to get the job done. However, as the name suggests, the director is the one giving the direction. They serve as the common link between all other members of the unit. They decide how the video is made and what kind of graphics or transitions are ideal. This is a great role to play considering that the student will not only learn how to lead but also work with a team and coordinate various functions. This person is in charge of the content. In films, their job would be to write the dialogues. However, for a morning announcement video, the role will vary a bit. Instead, they will be tasked with crafting the sequence of events. The screenwriter will be responsible for making sure everything has a certain flow and if the message being delivered is proper. For example, they will have to make sure the announcers are getting the right information. As the name suggests, this person is in charge of the audio. In a morning announcement video, this can include turning on the TV monitors, checking the audio equipment prior to recording, and checking the volume levels. During production, the audio technician will have to switch video sources between computers and the anchor, make sure the right computer screen is selected for the right audio stream, and press the right switch to go live when the camera person points. These are just a few of the tasks the audio technician takes care of. In short, their role is to oversee all audio related aspects of the production. So, pupils who have a thing for gadgetry and machines might be the ideal candidates for this job. This person is tasked with the job of creating the titles and graphics for the video. For this, they will be given access to resources such as still cameras, software, and computers. As the name indicates, this person is tasked with handling the camera and actually recording the production. In a professional film production, the cameraman has to pay attention to details such as lighting or angles. They must also be thorough with the camera’s technical features. Though a morning announcement video for school may not require such dedication, the cameraman still has a very tough job to do. They are responsible for visually reproducing the whole concept. What are the Students’ Positions in Morning Annoucements? Download our free worksheet + checklist that you can use together with your students in your classroom. The reporters are the ones who are going to actually be in front of the camera, delivering the announcement, messages, and news. Consider them as actors or to be more accurate, news anchors. They will be responsible for conducting interviews, preparing questionnaires, conversing with guests, and even scheduling the recording sessions. Finally, we have the talent. This person is responsible for collecting information and providing it to the scriptwriter. You could consider this person to be the researcher for the whole production. You can assign the task to either one pupil or a group. One of the first things you need to do after you assign the roles is to start with the training process. Ideally, this needs to begin at the end of the school year. This will give the students enough time to learn whatever they need to about broadcast and be ready for the whole thing by the time the new school year begins. Other than that, you will need to focus on aspects such as safety, appearance, technical matters, and teamwork. For example, when it comes to safety, make sure the students are taught to be aware of their environment. Teach them to watch out for cords or wires on the floor and how to respond if something happens. Establish a strict “no goofing around” policy. Similarly, make sure everyone is aware of their job descriptions. There shouldn’t be any confusion. Provide printouts/forms listing everything that the concerned student must do. For instance, create a specific list of responsibilities for the director and hand it over to him/her. Tell him/her they must stick to what’s mentioned in the form. It is a good idea to replace the host from time to time. Also, make ways for the current broadcast team to pass on their skills to the next batch. So, there you have it – student roles in a morning announcement video production. Getting students involved in such an effort is a great thing. It benefits their young minds and bodies tremendously. For starters, they are learning about how the broadcast industry works, while also gaining knowledge in various other areas. Then, there is the whole teamwork and communication thing, which, needless to say, are important values that will prove very useful in the future. 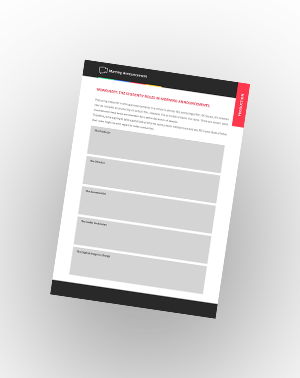 Free Worksheet + Checklist – download now! What are the Students' Positions in Morning Annoucements? Download our free worksheet that you can use together with your students in your classroom. You will also receive a checklist that contains the most common positions in morning announcements. You can hand out this checklist to your students afterwards.